When you think about appetizers, do you throw a bone to the healthy contingent and include some carrot sticks and hummus? Is your conscience soothed by adding celery sticks to your Buffalo chicken dip? Do you pick up a veggie tray at the store and call it good? Are vegetable appetizers an afterthought? I'm on a quest to create awesome vegetable appetizers--ones that are demolished before the cocktail weenies or cheese balls, because they are just damn good. I've got a Pinterest board, Awesome Veggie Apps and Snacks, and as I find new ways to turn vegetables into desirable appetizers I'm pinning them there. Please leave suggestions in the comments so I can add them--thanks! Last winter, I started things off here with a Slow Cooker Salmon Swiss Chard Artichoke Dip and a Skillet Mushroom Dip for Two. In the spring I started a craving for Five Layer Mediterranean Chicken (or Chick Pea) Dip that continues today. 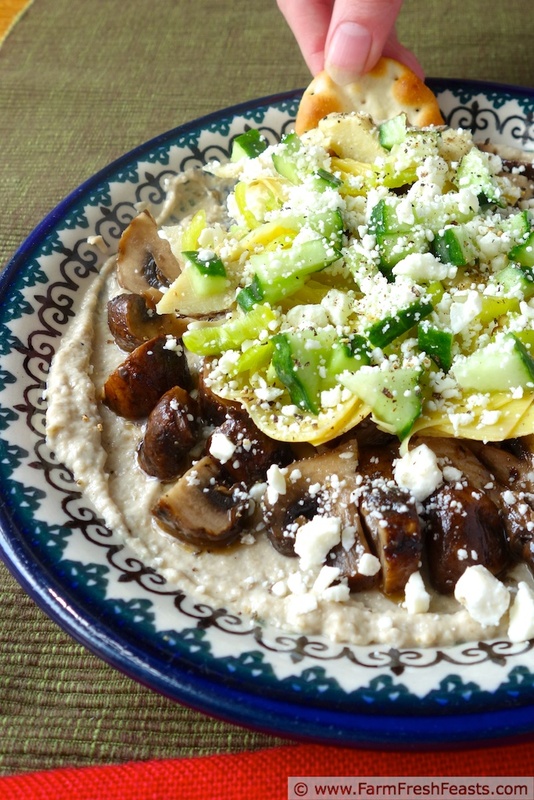 Lately, I've been kinda dippy, with Fattoush Dip with Kale and Sumac Hummus and Indian-spiced Eggplant Yogurt Dip. 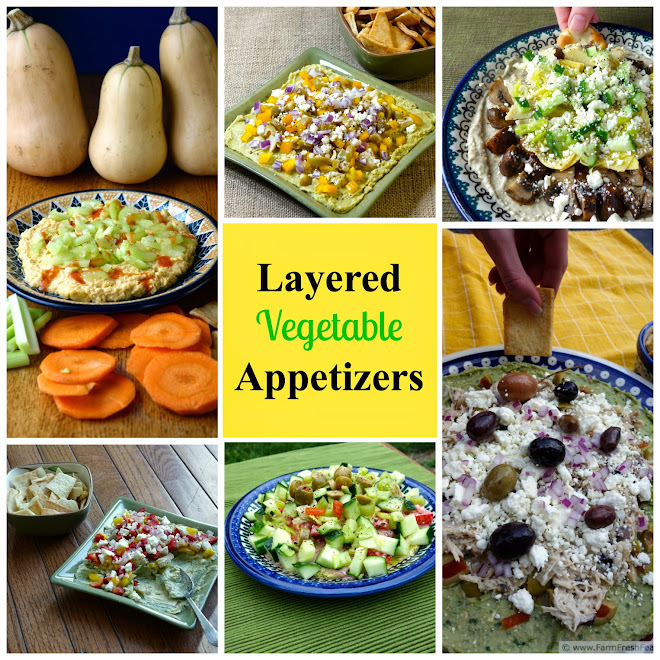 Today I want to share another delicious way to incorporate seasonal vegetables into your happy hour, cook out, tail gate, or indulgent dinner for one: the Layered Summer Vegetable Appetizer. While the autumnal equinox is weeks away here in North America, the mood has shifted to autumn. The kids are in school, football marching band season is in full swing, and the sled hockey gear is back out. However, the garden and the farm share are packed with late summer vegetables--peppers, eggplant, tomatoes and squash are filling up my weekly box. 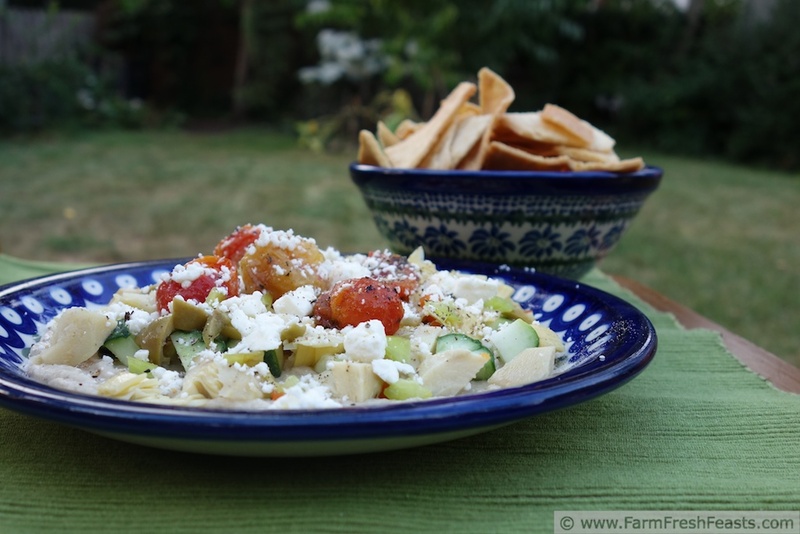 I created this layered appetizer to show off the best of late summer produce. The base of all my creations is a Baba Ghanoush/Ghanouj, made from the recipe in Farmer John's Cookbook: The Real Dirt on Vegetables with only a slight variation (I left out the oil, pine nuts, parsley, and cayenne pepper ). The result is a creamy, mild dip that lends itself well to a variety of toppings, which I've shown in photos and suggest below. Preheat oven to 375 degrees Fahrenheit. Stab the eggplant several times, and place on a rimmed baking sheet to roast for 30 minutes to an hour until soft (as shown--you can do this a day or two ahead if you've got the oven on). In a food processor (or using your mad ninja knife skills) finely chop the garlic, then add the cooled eggplant flesh (leave the skins for the compost) and pulse to combine. 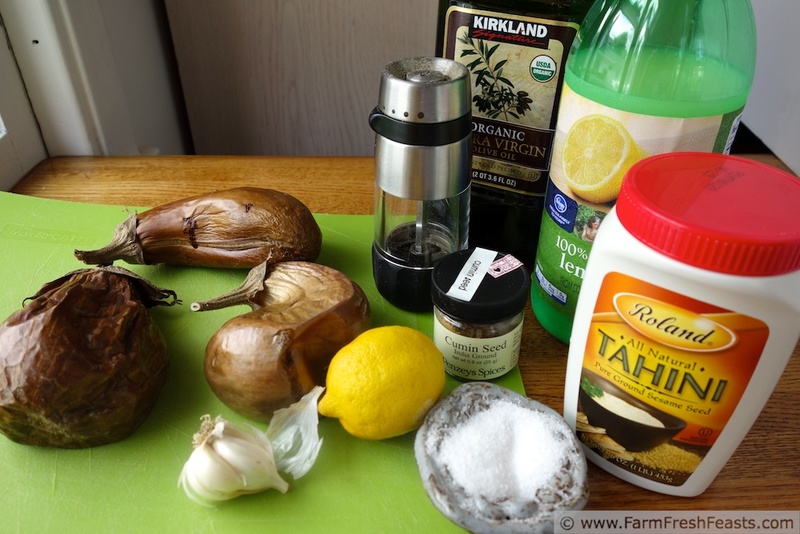 Add in the lemon juice, tahini, cumin, salt and pepper, and process (or stir) into a smooth texture. Chill for at least an hour--and this keeps for several days in the fridge. 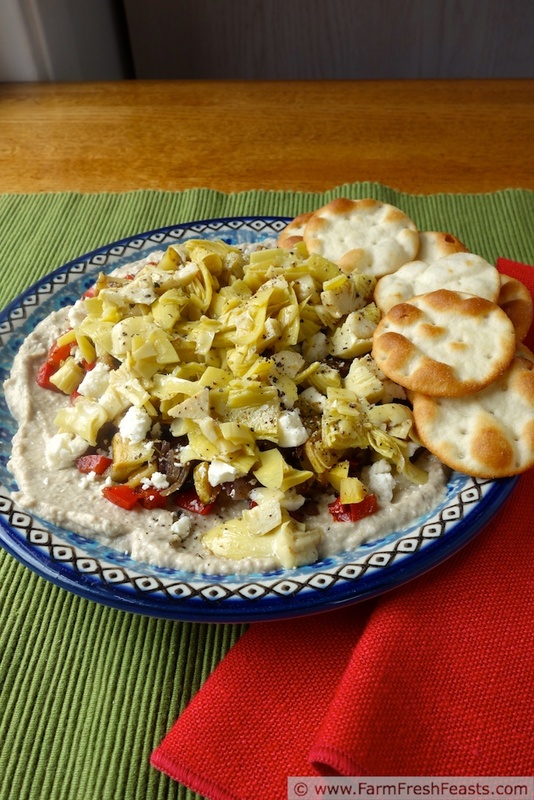 Prepare your appetizer by spreading a plate with 1/2 to 1 cup of baba ghanoush. Top with layers of vegetables, and cheese if you like. Add a pinch of salt and or a few grinds of pepper, and/or a dribble of olive oil before serving, then serve with the dippers of your choice. I'm partial to pita chips but I know not everyone is--Daikon radish rounds would be lovely here, or carrots, celery, corn chips . . . or a spoon. I'd eat every one of these dips (and have eaten a version of the Fattoush Dip four or five times now...I'm losing track, and I don't really care). I love the emphasis on making veggie appetizers more than just the poor step-child, and I think this is completely fitting with football season on its way (or already here). This would make a great dip for Sunday games; not that I'd watch them, but I'd certainly eat this. I'm delighted that I now have a visual of you watching football games. I'd love to see faces if I swapped this out for the Marching Tacos in the concession stand! If it's good for watching football, you know, perhaps it'd work? Wow, this sounds wonderful, healthy and delicious. I'll be fine--vegetables are tasty, and all I want to do is let them shine. I do love homemade baba ghanoush, and make it often. Nice idea to top with such a great selection of veggies. The eggplant just keeps coming in the farm share, so I'm having a good time playing around with this recipe. I don't think there's a good time to comment on food blogs as I always end up hungry, you know? I'm either ready for second breakfast or elevenses or I'm raiding the kitchen for a midnight snack. I'm sorry (no I'm not) for making you hungry. I'll never tire of new ways to eat eggplant. Looks delicious! I've roasted and frozen some eggplant to see if I can make at least the base of this in wintertime. Will keep you posted!